Well Spring has finally sprung and we are happy to see so many cottagers back! Many are pleased to see that Miss Nelle’s is still the place they know and love. We are happy to share some of our changes with everyone, an exciting new feature this season is ‘Miss Nelle’s Market’. Miss Nelle’s Market room has something for everyone. We carry a variety of items that make the perfect gift from local artists, jewelry from Echo Jibe, pottery from The Village Potter, and Soap from Log House Soap. Other gifts available are coasters, bookmarks, magnets cards and as always for sale is the artwork from local artist that still adorn the wall throughout Nelle’s. Gift Baskets make the perfect present you can choose from our ready made selections or build one from any of the items here at Miss Nelle’s. Miss Nelle’s Market also allows you to make your time at the cottage even more relaxing by taking home a frozen entrées and appetizers from the Farmer’s Daughter. We carry their delicious Chicken Pot Pie, Steak and Guinness Pie, Uncle Sheppard’s Far East Pie and Gluten-Free Vegetable Lasagna. We also carry Spreads, Dressings, Jelly and Preserves as well as nuts. 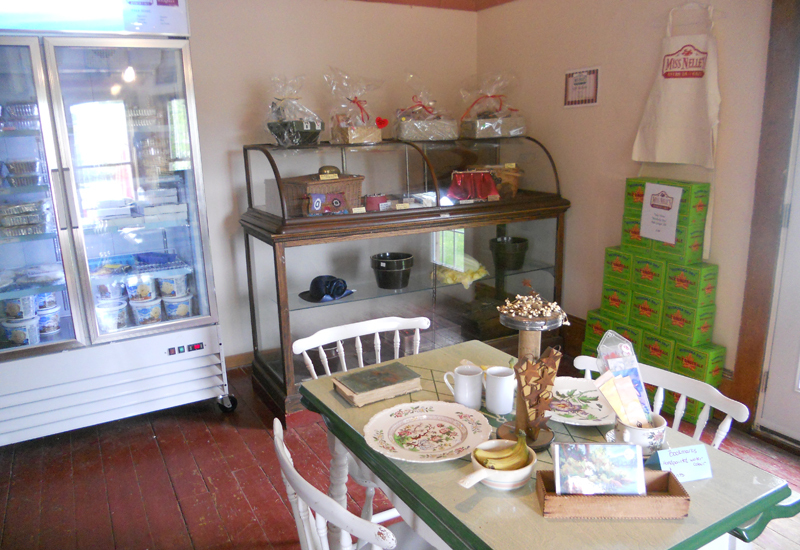 Farmer’s Daughter, located in Huntsville, provides us their handmade products with fresh ingredients. We are also please to carry Poppa Jim’s Honey and Maple Syrup from Emme’s Family. Candy is the other sweet item that can be found in the market. 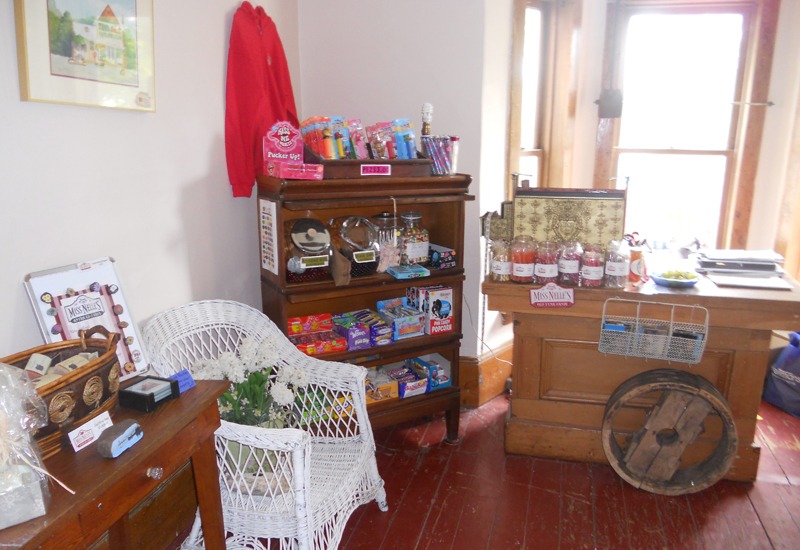 Come and browse through our large assortment of Olde Tyme Candy. Miss Nelle’s Wear rounds out the selection in the room with Hoodies, Fleece Blankets, Aprons and mugs ready for you to take home today. Antiques are still very much apart of Miss Nelle’s with four dedicated rooms upstairs as well as our tent outside and every room having an assortment to browse. The BBQ is back. We are serving up hamburgers, hotdogs, sausages and pea meal on a bun this summer rounding out the full summer experience offered here at Miss Nelle’s. We are looking forward to seeing you, so stop by today!